Applies to new 2018 models. Includes limited edition models. Can be combined with other offers. Offer ends April 30, 2019. Ural has been the world’s leading maker of sidecar motorcycles for over 75 years. Trusted by riders across the globe, our motorcycles are designed for you to share the adventures and explore further. Precision honing allowing more consistent sealing of rings at high temperatures. Better surface preparation for cylinder bore allowing faster and better break-in resulting in improved oil retention and longer cylinder life. Cooling fins increased in surface area by 30% for improved cooling efficiency. Pushrod tubes increased in diameter for improved pushrod clearance. Top ring face inlayed with high-tech plasma-sprayed Molybdenum offering increased lubricity and durability. Piston rings machined to ISO-Metric standards allowing for precisely calibrated end-gap. High-precision piston machining allowing one size of cylinder, no longer split into three size classes. Optimized port geometry for improved flow of gasses. Re-designed cylinder head covers attached with four screws for improved sealing. New oil pick-up designed to draw oil from the very bottom of the oil sump. Oil sump redesigned to maximize oil capacity without sacrificing ground clearance. Redesigned EFI system, innovation by Ural engineers. New throttle bodies from Keihin Corporation. Single ECU placed under the rider’s seat for optimum protection from engine heat and weather. Fuel injector location optimized for spray directly at the intake valves for increased efficiency. New self-priming, in-tank fuel pump with integrated fuel filter and pressure relief. Closed-loop EFI system with increased resolution for better fuel efficiency. High-efficiency catalysts for reduced pollution without sacrificing power. New spark plugs with pre-adjusted air gap. 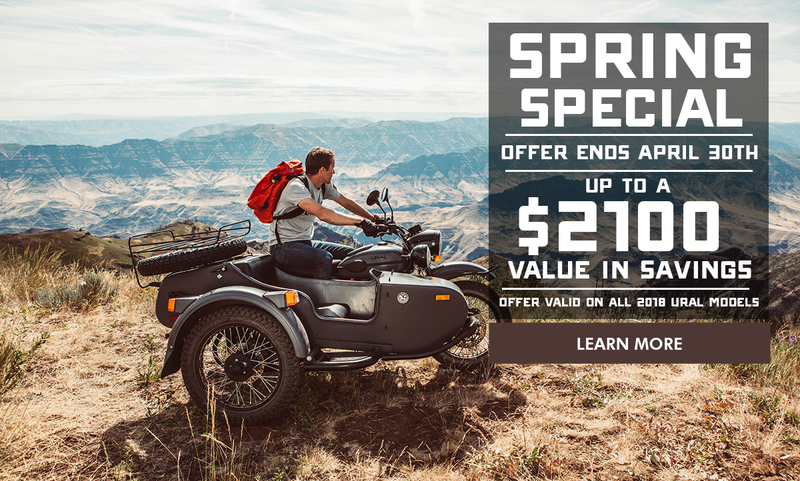 The Ural GEAR UP is the world’s most popular sidecar motorcycle. With more storage capacity than any other 3 wheeler and on-demand 2 wheel drive, it’s designed to take you wherever your adventure may take you. With a 749cc engine, a 5-gallon fuel tank, and on-demand 2-wheel drive, there's no telling where it will take you...Who will you ride with? Other models, color schemes, and accessories available for custom order.